Houdini isn’t an of-the-moment piece of urban theater. It is simply a restaurant with good food and earnest intent that just happens to be in one of the coolest spaces in the city. What separates Houdini from competitors is its style. Instead of the gooey Neapolitan style, or the adventurous toppings so frequently dashed together, the flavors here honor traditional Italian cuisine while the crust is crunchy and thin. Located in an industrial stretch of Ridgewood, this inventive pizzeria more than lives up to its creative name. Taking residence in a repurposed brewery built in the late 1800s, the red brick structure sits near the borough's massive cemeteries where this establishment's namesake has been laid to rest. 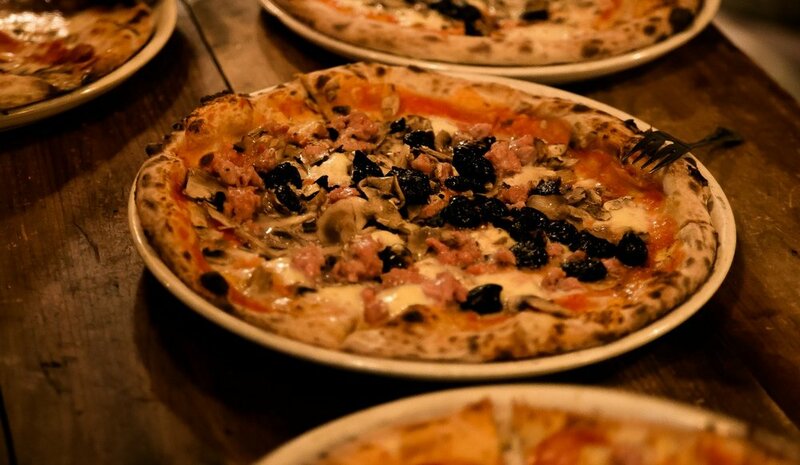 Far off any tourist map, this cool, cash only Ridgewood Pizzeria turns out a fantastic array of fancy wood- fired pies alongside Italian-learning apps; set in a former brewery, the funky place maintains an industrial feel and there's also a pleasant patio. TRADITION AND AUTHENTICITY MET IMAGINATION. Harry Houdini had the rare ability to make the impossible seem effortless. He developed an encyclopedic knowledge of magic and perfected death-defying escapes to become the greatest magician of all-time. We share this level of commitment and a remarkable flavor for life with Houdini. The Houdini Kitchen Lab is the brainchild of over 60 years of combined experience in the art of hospitality. Our belief is that a sublime meal comes from a delicate balance of preparation, freehanded naturalism, and using the finest ingredients available. Integrity and a process that respects traditions—such ideas are vital to our cooking. The flavors of our recipes range from succulent and hearty to sweet and piquant. Some dishes draw from our Italian heritage, others explore the imagination of what may happen when simple ingredients combine in unexpected ways. Each recipe and drink is thoughtfully selected to evoke its natural essence and to excite the palette. Harry Houdini brought warmth and wonder to his life’s work. We work to bring you the same with every plate served. Call (718) 456–3770 / EMAIL: houdinikitchenlab@gmail.com book a table. TOPPINGS- Make your own pizza!! Sign up for exclusive news and discounts!